One of the world’s great rivers, the Mekong winds its way through the steaming jungles and historic heartlands of Southeast Asia, boasting an ecosystem whose natural wealth is rivalled only by the almighty Amazon. Perhaps the most famous resident of this mighty waterway is the Mekong River or Irrawaddy dolphin (Orcaella brevirostris), one of the rarest in the world. As many as 80 of these now Critically Endangered mammals have made the pools of the Mekong their home. If you’re fortunate enough to spot them, and you approach quietly enough, you can actually hear the Mekong dolphins breathing through their blowholes. But that may be about to change, as the World Wildlife Fund (WWF) warns in a new video about the proposed damming and construction of a 280Mw hydroelectric power station on a tributary of the Mekong River at Hou Xangpheuak in Lao PDR. Construction will involve the blasting of millions of tons of rock from the site: “This will interrupt the habitat and breeding habits of the four remaining dolphins in the transboundary pool,” says Chhith Sam Ath. Building the dam will block migration channels for more than 500 species of fish. Alterations in water quality and levels across the Mekong basin will fundamentally alter the fishes’ natural habitat. The overall impact on fisheries (US$1.4 billion – $3.9 billion will be lost in fishery yields every year) and eco-tourism communities will decimate local livelihoods, potentially for generations to come. The WWF wants more environmental impact studies carried out and analysed in downstream countries, including Cambodia, and has called on both the Laotian government and Malaysia’s Mega First Corp to halt construction of the Don Sahong Dam. However, in a video posted to YouTube in July 2014 by Mega First Corp, the company that controls a 70 per cent stake in the dam project insists ‘fish will find a way’. Mega First Corp claims to have studied fish migration over several years and says the 30- to 32-metre-high (98-105 ft) Don Sahong Dam will have ‘no significant impact’ on the environment or annual migration routes. The video also cites local fishermen, who say that fishing has become less viable over the past five years. Fish Will Find a Way claims a video produced by Mega First Corp on the Don Sahong hydroelectric dam project. The Mega Corp video, on which comments have been disabled, makes no mention of the Irrawaddy dolphins, in particular the destruction of habitat that will occur as a result of the Don Sahong Dam being built. 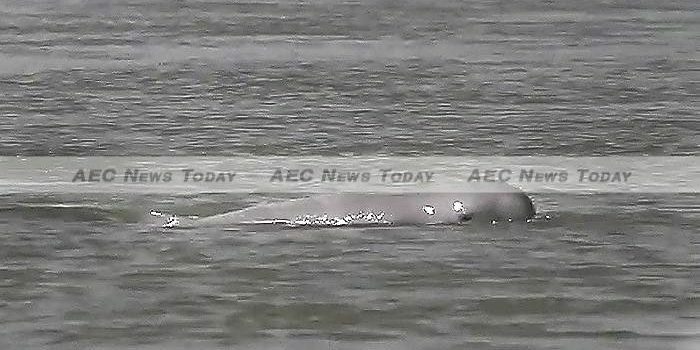 In recent years, a fledgling eco-tourism industry has sprung up downstream of the proposed Don Sahong Dam to cater to the increasing number of environmentally conscious tourists hopeful of catching a glimpse of the Irrawaddy dolphin.